Segway Racing Motoczysz remain the team to beat in the 2011 Isle of Man TT Zero race with both of their riders – Mark Miller and Michael Rutter – sitting on top of the qualifying session. Conditions were perfect for the second practice as all nine of the bikes for Wednesday’s Race lined up on the grid on Glencrutchery Road. 2010 TT Zero Race winner Mark Miller was first away followed by all Manx effort of Dan Kneen riding for the ManTTx. John Burrows was next away for American Outfit Lighting Motorcycles followed by the ION Horse outfit of perennial electric bike competitors Ecotricity Kingston University, the first of the four University outfits. Another University outfit, prestigious American based Massachusetts Institute of Technology were next off the startline with Allan Brew and all Japanese outfit Team Prozza and Yoshinari Matsushita followed them away. Roy Richardson and Russ Mountford, both competing on behalf of university outfits Imperial and Brunel respectively were the final University outfits and all eyes will be on the competition within the competition for the fastest University team in Wednesday’s SES TT Zero race that comes with a £5k prize fund. Last away was Michael Rutter, riding the second Sedgeway Racing Motoczysz outfit and he was quickly into his stride, leading on corrected time at Glen Helen with 5.45.46 (101.081mph). John Burrows split the Motoczysz pair with a 10 second lead over Mark Miller who was third at the first checkpoint in 6.52.85. George Spence (7.11.56), Allan Brew (7.21.69), Russ Mountford (7.38.52) and Joshinari Matsushita (8.32.11) were the only other outfits to remain on the course as Dan Kneen and Roy Richardson retired on Bray Hill and at Crosby respectively. Rutter continued to set the pace and after extending his lead to over a minute from Burrows by Ballaugh with an average speed of 106.647mph he posted an impressive 138.4 through the Sulby speed trap. With Burrows dropping out at Whitegates and Mountford retiring at Alpine, Rutter was left with only his team-mate Miller (81.133mph), Kingston’s Spence (80.442) and fellow University competitor Brew (78.536) in close proximity and finished with a lap of 24.15 at an average speed of 93.353mph for the 37 ¾ mile course. Yoshinari Matsushita also brought the Team Prozza bike home in 35:59.22 (62.906mph). 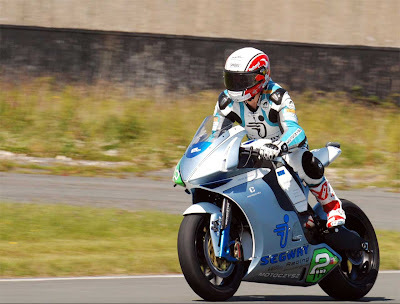 The teams will now prepare for Wednesday’s SES TT Zero Race and the prospect of the first 100mph lap, which comes with a £10k prize fund from the Isle of Man Government remains a possibility.